What is a bar graph or column graph? A bar graph or column graph is a pictorial representation of numerical data in the form of rectangles (or bars) of equal width and varying heights. These rectangles are drawn either vertically or horizontally, keeping equal space between them. The height (or length of a rectangle depends upon the numerical value it represents. How to draw a bar graph or column graph? How to make a bar graph or column graph? Suppose some numerical data is given to us, and we have to represent graphs by a bar graph on a graph paper. Step 1: On a graph paper, draw a horizontal line OX and a vertical line OY. These lines are the x-axis and the y-axis respectively. Step 2: Mark points at equal intervals along the x-axis. Below these points write the names the data items whose values are to be plotted. Step 3: Choose a suitable scale. On that scale determine the heights of the bars for the given values. Step 4: Mark off these heights parallel to the y-axis from the points taken in Step 2. Step 5: On the x-axis, draw bars of equal width for the heights marked in Step 4. They should be centered on the points marked on the x-axis. These bars represent the numerical data. 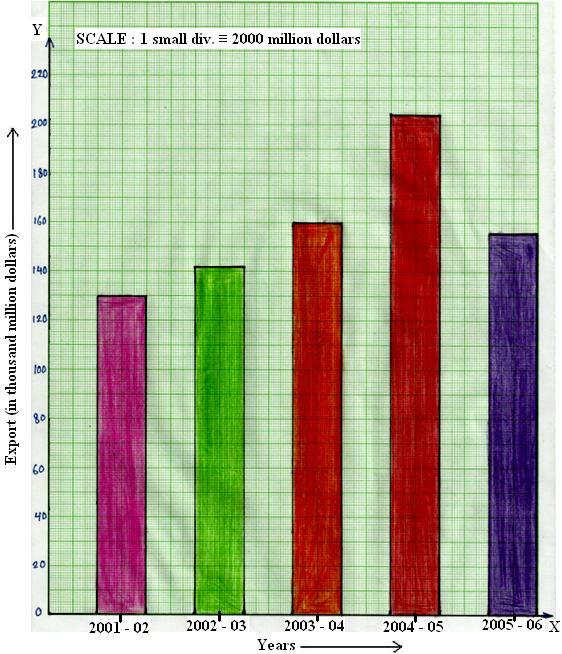 Now let us look at some examples showing how bar graph or column graph are drawn. 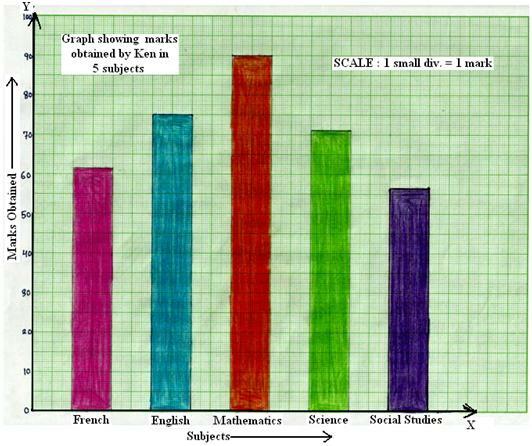 Draw a bar graphing charts to represent the above data. Step 1: On a graph paper, draw a horizontal line OX and a vertical line OY, representing x-axis and the y-axis respectively. Step 2: Along OX, write the names of the subjects at points taken at uniform gaps. Step 3: Choose the scale: 1 small division ≡ 1 mark. Step 5: On the x-axis, draw bars of equal width and of heights obtained in Step 4 at the points marked in Step 2. The completed bar charts or column charts are shown below. Draw a bar graph or column graph representing the above information. Step 1: On a graph paper, draw a horizontal line OX and a vertical line OY, representing the x-axis and the y-axis respectively. Step 2: Along OX, mark the weeks at points taken at equal gaps. Step 3: Choose the scale: 1 small division ≡ 20 cycles. Step 5: Draw bars of equal width and of own heights calculated in Step 4 at the points marked in Step 2. Draw a bar graph representing the above data. Step 2: Along OX, mark the years at points taken at equal gaps. Step 3: Choose the scale: 1 small division ≡ 2 thousand million dollars. Step 5: At the points marked in Step 2, draw bars of equal width and of heights calculated in Step 4. How to read bar graphs? From a bar graph, we can draw certain conclusions. This is known as reading or interpretation of the bar graph or column graph. 4. Given below is a graph showing the number of electric bulbs sold in a shop during a week. (i) On which day of the week was the sale minimum? (ii) On which day of the week was the sale maximum? (iii) What was the total sale during the week? (iv) What is the ratio between the minimum sale and the maximum sale? (i) It is clear from the bar graph that the bar of minimum height corresponds to the sale on Friday. Therefore, the sale was minimum on Friday. (ii) From the bar graph, we find that the bar of maximum height corresponds to the sale on Monday. Therefore, the sale was maximum on Monday. 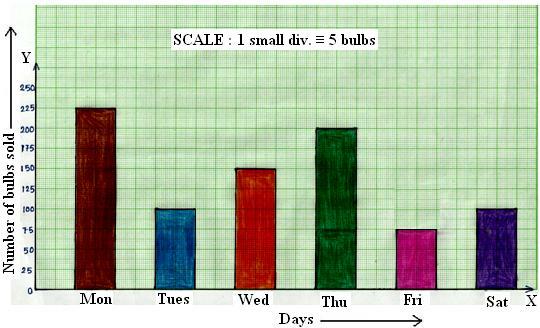 (iii) The total sale during the week = (225 + 100 + 150 + 200 + 75 + 100) bulbs = 850 bulbs. (iv) The minimum sale during the week = 75 bulbs. The maximum sale during the week = 225 bulbs. Therefore, minimum sale : maximum sale = 75 : 225 = 1 : 3. 5. A column graph is given below. (ii) In which year was the production maximum? (iii) After which year was there a sudden fall in the production? 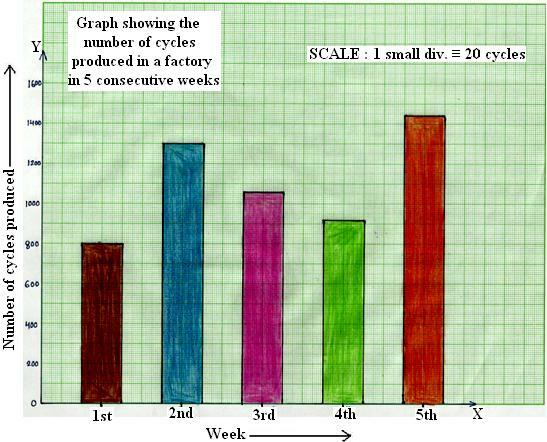 (iv) Find the ratio between the maximum production and the minimum production during the given period. (i) The given bar graph shows the annual production (in million tones) of food grains in an American state during the period from 2002 to 2006. (ii) It is clear that the bar of maximum height corresponds to the year 2004. So the production was maximum in that year. 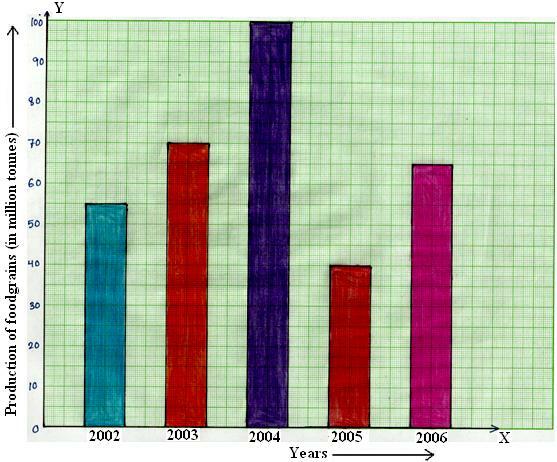 (iii) From the bar graph, we find that there was a sudden fall in the production after the year 2004. (iv) The maximum production during 5 years = 100 million tones. The minimum production during 5 years = 40 million tones. Therefore, maximum production : minimum production = 100 : 40 = 5 : 2.